New mini split Air Conditioning system just installed to make your Kuhio Shores 415 cooling experience perfect. Open windows, trade winds, fans to hear the soothing sounds of the ocean. And now if none of the above works you have use of a quiet, efficient air conditioning system to make your stay as comfortable as possible. By checking out our Mike Galvin oceanfront condo you will see it is less than 50 feet from the water's edge, this fourth floor Poipu oceanfront condo has unobstructed views of sunsets, whales, turtles, dolphins, cruise ships, surfers, and other marine activity. 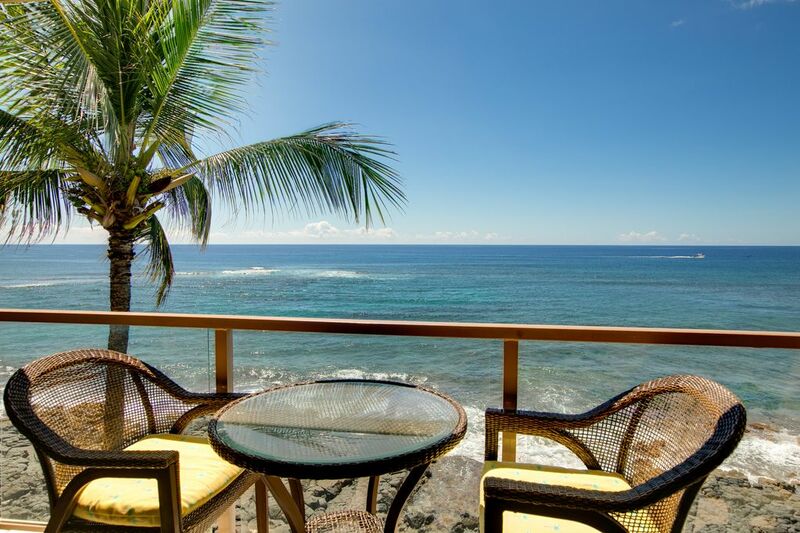 Located in the sunny Poipu area just steps from a great snorkeling beach and one of the island's best restaurants. Within walking distance of other excellent swimming beaches, fishing and sightseeing. This one bedroom, one bath, 850 square foot vacation condo sleeps up to four people. Features include phones, wireless DSL, 32 and 24 inch Flat screen TVs, VCR, CD/tape player, stereo, fully equipped kitchen with microwave, dishwasher, cozy lanai and parking. This is a Non-Smoking condo. We have been coming to Kauai since 1975. We fell in love with the island and especially the Poipu area. We purchased our first condo 415 in 1998 and our second one in 2003. We spend January and February every year at Kuhio Shores working on our condos and enjoying the Island of Kauai. The rest of the year is spent talking to the wonderful people who want to come to Kauai and stay at Kuhio Shores. Close to everything, excellent walking/jogging, restaurant right next door, best snorkeling just minutes from the front door, superb views of turtles, whales, surfers, sunsets right in front of you. Fall of 2009 brings the opening of the new Kukui'ula shopping village a very short walk from Kuhio Shores that will feature more excellent restaurants and shops.